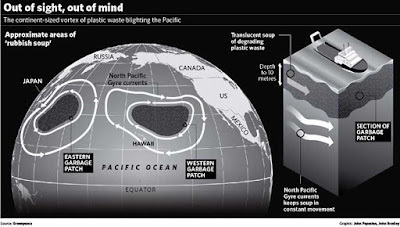 Did you know that there are two continent-sized clusters of plastic garbage slowly swirling around in the Pacific ocean? I didn't know anything about it until someone mentioned it to me last week. In case you're as unaware of this monstrosity as I was, here's an excellent L.A. Times story on it, which includes very informative graphics, photos and videos. 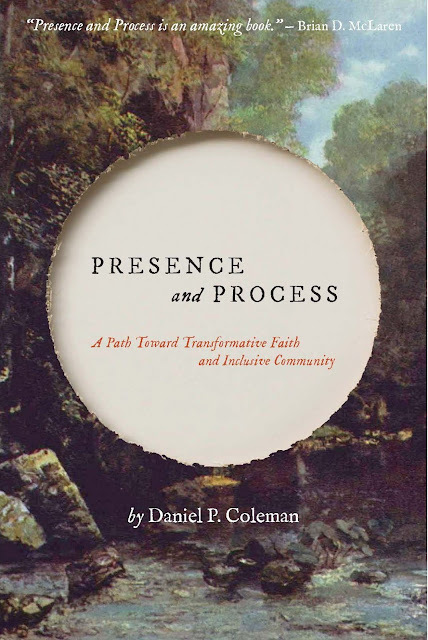 ...The Quaker discovery and message has always been that God still lives and moves, works and guides, in vivid immediacy, within the hearts of men. For revelation is not static and complete, like a book, but dynamic and enlarging, as springing from a Life and Soul of all things. This Light and Life is in all men, ready to sweep us into its floods, illumine us with its blinding, or with its gentle guiding radiance, send us tendered but strong into the world of need and pain and blindness. Surrender of self to that indwelling Life is entrance upon an astounding, an almost miraculous Life. It is to have that mind in you which was also in Jesus Christ. "Behold, I stand at the door and knock." In the silence of your hearts hear Him knock. Outward teachers can only lead us to the threshold. But "God Himself has come to lead His people." Such men and women must be raised up, heaven-led souls who are not "seekers" alone, but "finders," finders who have been found by the Father of all the world's prodigals. "The basic response of the soul to the Light is internal adoration and joy, thanksgiving and worship, self-surrender and listening. The secret places of the heart cease to be our noisy workshop. They become a holy sanctuary of adoration and of self-oblation, where we are kept in perfect peace, if our minds be stayed on Him who has found us in the inward springs of our life. And in brief intervals of overpowering visitation we are able to carry the sanctuary frame of mind out into the world, into its turmoil and its fitfulness, and in a hyperaesthesia of the soul, we see all mankind tinged with deeper shadows, and touched with Galilean glories. Powerfully are the springs of our will moved to an abandon of singing love toward God; powerfully are we moved to a new and overcoming love toward time-blinded men and all creation. In this Center of Creation all things are ours, and we are Christ's and Christ is God's. We are owned men, ready to run and not be weary and to walk and not faint." Are you a Friend of Truth? Having a baby is painful. For me, as a man, this is a belief. For my wife, who has had babies, it is truth. There are many things about God and Christ which one may believe because they have been taught by people whom one respects. There are things about God and Christ which one knows because they have been personally experienced. We know that for one person to memorize, to recite, even to believe what other people have taught does not make that person a Friend of Truth. Rather, it is when that person has been convinced, by direct experience. + Have you witnessed, yourself, convincing evidence of God’s existence? + Have you ever felt God’s love? + Do you long to be closer to God - to experience His love continuously? + Have you ever heard the Word of God whisper deep inside you, to tell you He loves you and to teach you how to live and how to love Him? + Has the Light of God ever shone into your heart, to make plain all the things there that are bad and to strengthen all the things there that are good? + If you read the first chapter of the Book of John, do you recognize that the Word and the Light described there are the same Word and Light that speak and shine in your heart? + Do you know that what keeps you from being closer to God is your desire for things, or thoughts, or behaviors that are not Godly? + Have you ever experienced being washed, or “baptized” inwardly, in your heart - being freed, if only for a moment, from your desire for the things that keep you from God? + When your spirit hungers and thirsts, is it given food and water directly by Christ, the bread of life and the spring of living waters? If your answer to any of these questions is, “yes”, then you know some of the Truth that we do. We could well say of simplicity what Thomas 'a Kempis said of compunction of heart: "It is better to practice it than to know how to define it." I think the same could be said about most aspects of theology. Did you know that there is a Japanese rock band called "Quaker Meeting"? Talk about incongruity. I wonder if there is a story behind them choosing that name or if they just picked it at random. It reminds me of a story my friend Chris told me. He was touring Japan with a well-known band. On a day off, he and the bass player visited a temple. As they walked around the beautifully manicured grounds, and old Japanese woman in traditional dress spotted them and smiled sweetly. She walked up to them and shouted, "WAZZUP!" I was once driving in the car, flipping through the radio stations, getting annoyed with all of the "sound and fury, signifying nothing". The thought occurred to me, "Why not listen to the Quaker radio station?" "Good idea." I chuckled, turned off the radio and enjoyed the silence. Compliments of The Quaker Shop. I love this video! I stumbled upon it at Brent Bill's blog. In the late 90's I was self-employed as a contract trainer. I traveled around the country teaching Cisco, Microsoft, Novell, A+ and Network+ classes. Training companies would host the classes, enroll the students and then bring contractors like myself in to teach them. It was very lucrative. I was making between $600.00 and $1,000.00 a day, plus expenses. The down side was that I had to travel constantly and invest a lot of time studying, certifying and keeping up with all of the technologies that I taught. Then, in March of 2000, the dot.com bubble burst. Almost overnight, the work dried up. Rather than sending employees to training, companies began laying them off. Classes began canceling. Training companies began going out of business, in large numbers. I went for months with very little work. We had just enough in savings and occasional consulting jobs to cover basic living expenses. We were caught unprepared. Two years before this, we had bought a charming old house with a spectacular view across a valley. We had been pumping tens of thousands of dollars into renovating it. It was, of course, a money pit. Now we found ourselves upside-down (meaning the value of the house--what we could sell it for--was way less than what we owed on the mortgage) in a half-remodeled house, with a huge second mortgage, auto payments, massive credit card debt and, quite suddenly, no work. It took 6 months for me to find a job. At that time, you could barely throw a rock in Seattle without hitting an unemployed network engineer. I got hired on at Nintendo as a lead network engineer, making in a month what I had previously made in a week. But by that time the damage was done: our financial ship was irreparably sinking. We filed for bankruptcy and had our house foreclosed on. I'll never forget the sense of shame and humiliation. We had utterly failed to manage our money wisely. I had failed to provide for my family. I had broken my word to our many creditors. We had to go stand before a judge in a packed Bankruptcy Court. A Foreclosure Notice was nailed to our front door, for all the neighbors to see. Within a few short months, I had gone from thinking of myself as a success to having to admit to the world that I was an utter failure. Yet, through this time a most amazing thing happened: Carla and I both felt the presence of God like we had never felt Him before. He was a steady, peaceful presence. We realized that, when everything had been stripped away, He was the ground beneath our feet. He always had been, we had just forgotten. And so, as we mourned the loss of our dreams, we were comforted. In the midst of this, my friend Timothy came to me and told me he had a message for me from the Lord: "Danny," he said, "the problem isn't that you failed. The problem is that you were succeeding in the wrong direction. God is redirecting you." It was true; we had become pretty worldly and I had hated the constant travel--being away from my family so often during those years. Now all of that was gone. Carla and I look back on those times now as one of the best things that ever happened to us. Our entire lives were redirected. Our values changed. I found myself set on a course of intense spiritual, theological and Biblical study that continues to this day. We try to live simply now. We carry no debt, own no credit cards. We drive old cars that are paid for. We live within our means. We are much, much happier and less stressed. Most importantly, we know that He is always with us and will never leave us, no matter how badly we screw up. for theirs in the kingdom of heaven. Someone once described Christian evangelism as "one beggar telling another beggar where to find some bread." To be poor in spirit is to be aware that we don't have it all together. In fact, we realize that we have little, if anything, to offer God. When we are good and kind and compassionate and unselfish, God is--I'm sure--pleased, but not impressed. He knows how quickly we can switch to being wicked, rude, uncaring and selfish. God isn't freaked out by our sin, just as He isn't amazed by our saintliness. He knows us completely and yet loves us completely. I believe it was Philip Yancey (or maybe Brennan Manning) who wrote, "There is nothing you can do to make God love you more than He already does. And there is nothing you can do to make God love you less than He already does." God's love is perfect, which means that it isn't about us. It's all about Him. To be poor in spirit is to have a realistic understanding of who we are, in relation to God. We are the objects of God's love, simply because we are His creations and He has chosen to love us unfailingly. This ought to make us humble. There are a few different Greek words which translate as poor. One of the most commonly used is penei, which refers to the working poor--those who are able to earn just enough to make it through the day. This is not the word used in this Beatitude. The word used here is ptochos. Ptochos refers to those who are utterly destitute and unable to help themselves--they are completely dependent upon the kindness and compassion of others. In the Beatitude, Jesus says that the kingdom of heaven belongs to these ones who are destitute in spirit. Historically, many have misunderstood Him to be speaking of Heaven (as in, the place you go when you die). But Jesus is not referring to the afterlife. The Greek word translated here as kingdom is basileia. Basileia refers to the rule and reign. If I lived in England right now, I would be living in the reign of Queen Elizabeth. But does Queen Elizabeth rule? Not really. She's more of a ceremonial figure and her monarchy is mainly titular. She doesn't call the shots. When I am in the jail, I sometimes describe the kingdom of God like this: "Inside of this jail, we are in the kingdom of the County Corrections Department. What they say goes. We are within the realm of their reign and their rule. Their basileia. Their will be done." What is the kingdom of heaven then? It is God's rule and reign in our lives. It is God's will made manifest. What is God's will? To restore. To reconcile. To comfort. To heal. To enfold. To bring peace. To feed the hungry. To free the enslaved. To advocate for the marginalized. To stand up for the oppressed. To forgive. To love. Many of the Jews of Jesus's time were anxiously awaiting the coming of God's kingdom. They imagined it as a Jerusalem-based theocracy in which God would drive out the Romans, judge the Gentile nations and vindicate the Jews as his chosen people, for all the world to see. Many Christians today hold to a remarkably similar set of expectations. But Jesus kept saying, in essence, "No, the kingdom isn't like that. It's like this..." When He would heal someone, or cast out an evil spirit or restore someone to life, He would say "The kingdom of heaven is at hand". In Luke 17:20-21, Jesus is asked by the Pharisees when the kingdom of God would come. They are thinking in terms of a temporal empire and their position within it. Jesus answers their question by saying, "The kingdom of God does not come with careful observation, nor will people say 'Here it is,' or 'There it is,' because the kingdom of God is within you." Jesus said that He came to show us what God is like. "If you have seen Me," He said, "you have seen the Father." (John 14:9, 12:45, 10:30, etc.). What Jesus showed us was not a distant God or a vengeful God or a God of rules and regulations. Rather, He showed us a God who rolls up His sleeves and (literally) gets down into the muck with us. Jesus showed us a God of compassion and forgiveness who is relentlessly committed to loving and restoring us. When we begin to grasp and encounter this God, we realize that in the face of such Love, we are indeed beggars. We can do little more than gratefully receive the goodness He pours out upon us. As we open up to allow His love to flow into us, we are changed from the inside. And not through anything that we can really take credit for. His love fills us and begins to leak out from us onto those we come into contact with. Just as the moon reflects the light of the sun; just as Jesus reflected God; so we begin to reflect Jesus. We begin to see the rule and reign of God occurring in our own little worlds. We find ourselves, in these moments, in the midst of the kingdom of heaven. Beggars all.